Nigeria Police Force say two former traffic officers dey charged to court say dia hand follow for di death of Civil Defence officer Ogar Jumbo for Abuja for March 2019. For statement, police say dia investigate show say true-true Traffic Warden GII Idoko Sunday and Traffic Warden GII Katdel Dabit get hand for di death of oga Jumbo and na wetin make di force sack dem before di charge. "Police investigate show say dem bin use unnecessary gra-gra on Ogar Jumbo even afta dem arrest am. "And say forensic evidence show say na di wound wey di traffic police give am, kill am." Na wetin dem tok for statement wey dem post for dia twitter page. 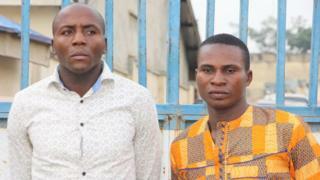 As at now, di two suspects dey Kuje Prisons dey wait hearing on dia case. Last month Ogar Jumbo wife bin tell BBC Pidgin say na di police kill her husband wen dem bin dey cari dia pikin go school. Di incident wey happun for di kontri capital, bin shock many pipo as di pikin dem bin see as di police officers take beat-beat dia papa. Police dey try to bring back di faith of Nigerians come dia side as dem dey di middle of accuse of police brutality wey don cause plenti pipo to die.